The City of Mayer used Danfoss VLT® AQUA Drives for energy savings with their three blower motors employed at their wastewater treatment facility. Reduce the costs of running a city’s wastewater treatment facility through improved efficiency of the blower motors. Installation of three Danfoss VLT® AQUA Drives, saving the City of Mayer about $8,738.00 in annual electricity costs. Known as the “Land of 10,000 Lakes,” Minnesota takes its environment and its water resources seriously. That’s why the City of Mayer, a town of about 1,800 in Carver County, Minn., was proud to have its Wastewater Treatment Plant Operator recognized by the Minnesota Rural Water Association (MRWA) for implementing innovative energy savings using Danfoss VLT® AQUA Drives. The plant employs three blower motors to perform one of the most important parts of the wastewater treatment process: aeration. Blowers agitate the sewage and inject oxygen into the water so microbes can remove contaminants. But only the right amount of oxygen will do — too little will not allow the microorganisms to break down organic waste; too much will cause the microbes to cannibalize themselves and die off. Kluver notes that the City of Mayer’s Water Treatment Plant is designed as an Extended Aeration Activated Sludge Facility – which depends on maintaining the proper balance of microorganisms. In this plant design, the incoming wastewater – the influent – flows into a pre-treatment building to remove physical material, such as grit and sand. Then, primary treatment is begun. Sediment is settled out, and phosphorus is detained by using an anaerobic and anoxic tank in which the bacteria, in the absence of oxygen and nitrates, accumulate phosphorus. The mixed liquor flows to a secondary clarifier (settling tank), where the activated sludge settles out. A portion of the sludge is returned to the head of the aeration basins to maintain a high population of bacteria to break down the organics and to maintain a constant flow rate. The remaining sludge is pumped to a digester, where it is stored, then trucked in spring and fall to another facility for final treatment and disposal. The remaining clear liquor passes through bridge sand filters and ultraviolet disinfection before being discharged to the South Fork of the Crow River. Together, the two concrete aeration basins can handle a total combined volume of about 320,000 gallons per day. To supply enough oxygen into the wastewater, blowers must deliver up to 650 CFM of air. The VFD slowly ramps the voltage to bring the blower up to speed. The Danfoss VLT® AQUA Drive can be programmed to receive a signal from the dissolved oxygen (DO) sensor and adjust blower speed accordingly. Kluver contacted Brian Peterson of Schwab, Vollhaber and Lubratt, Inc. (SVL), of Shoreview, Minn., near St. Paul, with a VFD specification. 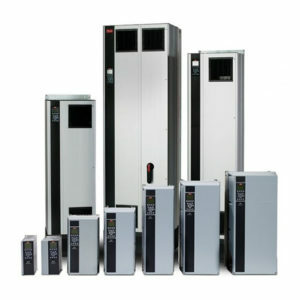 Peterson recommended three Danfoss VLT® AQUA Drives.